As the year winds down and December's holidays fast approach, many Americans' attention naturally shifts away from the workplace to more personal matters. 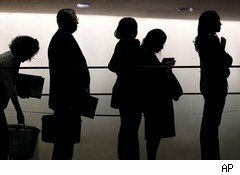 But with the nation enduring its second consecutive holiday season of around 10% unemployment, lots of people, especially those looking for work, are eager to see the nation's jobless rate drop. Despite the seeming lack of progress, however, an increasing number of observers, citing a preponderance of positive data, are expressing optimism that the stagnant labor market is finally beginning to gain momentum. Last week, for example, the number of Americans filing for initial unemployment benefits fell by 17,000, the second such drop in three weeks, and at 421,000, the figure is the second lowest of the year. Further, the four-week average of new claims, considered a more accurate measure, is its lowest level since before the heart of the economic crisis in 2008. Of course, jobs remain a priority for the Obama administration, which is why the president is meeting with 20 of the nation's CEOs on Wednesday to discuss ideas for creating jobs and making the U.S. more competitive among nations. The need to boost employment is one reason Obama is eager to see the tax deal that he brokered with Republicans become law. As many analysts have pointed out, the legislation is in effect a second stimulus, designed to encourage consumers to spend and businesses to hire more workers. Another sign that the employment front is brightening emerged from an annual economic forecast luncheon held in Phoenix, Ariz., earlier this month. Arizona, along with California, Nevada and Florida, was among the hardest hit states in the recession in part due to its economy's reliance on economic activity in the construction sector. The gathering of about 1,000 local business and civil leaders listened to a panel of economists who offered an upbeat assessment of the advances the overall economy has made this year, according to the WorldAtWork Post blog. Not the least of those, noted by economist Joel Naroff, were 11 months of consecutive job growth and double-digit increases in sales of software and automobiles. Naroff said the national economy should be extremely strong and generating "large job growth" by spring. But the problem, he said, is rather simple: Americans, given their penchant for immediate gratification, are expecting a quick, robust recovery -- not one that's slowing building steam on the back burner. To many Americans, a slow boil doesn't feel much like recovery at all, and that's likely why the uptick in the economy has seemingly come in fits and starts. Consumers who are concerned that the economy may indeed reenter recession -- the dreaded "double-dip" -- aren't keen on spending big when they feel vulnerable to job loss. "The situation is definitely frustrating right now," says John Challenger, CEO of Chicago-based job-services firm Challenger, Gray & Christmas. Though jobs have been added each month this year, the gains have come at a very slow pace. "It often looks and feels like every two steps forward is met with one step back," Challenger says. Still, like Naroff, Challenger is optimistic that the job market will improve steadily next year. Planned job-cut announcements tracked monthly by his firm declined significantly in 2010. Through the end of November, employers have announced a total of about 498,000 job cuts this year, down 60% from the 1.243 million announced during the same 11-month period in 2009. Further, Challenger says employers, despite perceptions to the contrary, are indeed hiring. In the six months ending September, 25.7 million workers were hired, according the Bureau of Labor Statistics' Job Openings and Labor Turnover survey. At the same time, however, the total number of workers who either quit or were fired equaled 25.4 million, resulting in a net plus in overall employment of about 300,000. That modest outcome leads Challenger to remind frustrated job-seekers to bear in mind that the employment market is fluid and thus constantly changing. "Part of a successful job search is being in the right place at the right time," he says, and that requires a combination of preparation, strategy, networking and perseverance. If Challenger and the other economists in Arizona are right, that search may be successful in 2011. Challenger, Gray & Christmas will be hosting its annual two-day national job-search hotline on Dec. 27 and 28. Job-seekers can get more information about it at http://challengeratworkblog.blogspot.com.